Cochin (Kochi) is a major city and an important commercial centre. Read the following article to know more about the tourist attractions in Cochin. Cochin (also known as Kochi) is the commercial capital of Kerala. The city holds the reputation of being one of the finest natural ports in the world. Kochi has an impressive history of subsequent rise and colonization by European forces. Portuguese were the first to establish their base in Kochi. Thereafter, Dutch came to the city, followed by the English, to establish their base. Cochin is the only city in the country that is formed by the union of three different Princely States which includes Travancore, Cochin and the British Malabar. 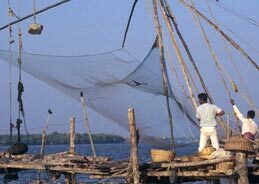 Cochin is a perfect holiday destination where visitors can relax in the natural harbor with serene backwaters serving as the backdrop. Marine Drive is one of the most beautiful parts of Kochi Also known as Shanmugham Road, Marine Drive is among the best places to hangout with friends and family. 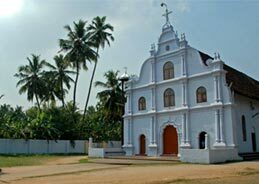 Located in Kochi, Santa Cruz Basilica is a historical church built by Portuguese. The church received the status of a Cathedral from Pope Paul IV, in 1558 AD. It was later captured and demolished by the British. After a span of hundred years, in 1887 AD, Bishop Dom Gomez Ferreira constructed a new building at the same location. It was declared as a Basilica by Pope John Paul II in 1984. Jewish Synagogue is a historical monument and one of the prime tourist attractions of Kochi. Built in AD 1567, and later renovated by Dutch in AD 1664. Important items kept in the synagogue include the famous copper plate given by Bhaskara Ravi Varma, a golden crown offered by the Maharaja of Travancore and the great scrolls of the Old Testament. Wellington Island is a manmade island designed by Lord Bristow. Named after the British Viceroy of India, Lord Willingdon, the island is located between Ernakulam and Mattanchery. This manmade island is now the location of many important buildings, including Government offices, shipping companies and hotels. Located 16 km east of Cochin, Hill Palace Museum is a classic example of the blend of European and Kerala’s traditional style of architecture. This beautiful palace was built by Dutch and was gifted to the Raja of Cochin, Sakthan Thamburan. The museum preserves the belongings of the Royal family as well as antique coins, palanquins, wooden sculptures, paintings. From Nedumbassery International Airport, which is 25 km north of Cochin, one can board flights to many national and international destinations. Ernakulam Junction is an important railway station of Southern Railways, which connects Cochin to other important cities within the state and the country. Frequent bus service available from Ernakulam connects Cochin to other major cities of the state.